New Airush Vapor due in any day. Airush’s new Vapor is about to land in Surfstore. For those of you who have had little experience of teh Vapor kites, it has been a sensation to the company, building one of the industries best handlin kites, with exceptional range and non aggressive but very capable flying characteristics. Airush say that their 5th line equipped flatter canopy Vapor III is the most direct handling kite they have produced yet. It spans the void between their full on C kite, the Generator, and their Flow all-rounder. The VIII promises to offer the direct, dynamic feel and performance of a potent C kite and the rollover relaunch and depower that riders have come to expect from high-depower bridled kites. Airush’s trigger activated quick release (more on that in a mo) is back in on the VIII bar’s chicken loop and the clam cleat trimmer resides there also. You can leash up for unhooked riding, to the 5th line or to the rear line. Other than that, the 5 line cleat bar is a very simple and uncluttered piece of kit. The one pump was very welcome since the waves were cranking and the rigging options are simple and restricted to the front lines. We had initially wondered if the quick release trigger could be falsely activated when scrabbling to hook back in after unhooking, but in practise it’s just not an issue. The trigger releases pretty effortlessly when the chicken loop is held taught, but when the CL is grabbed, it moves up against the trigger and prevents unwanted release. Reassembly is quick even with numb fingers. Into the waves and we straight away felt the Vapor III to be a powerful kite when stood back to back against other high depower kites. It is not over sensitive to trim and thus keeps driving hard and so it was winning the upwind tack against the other kites at our wave spot time and again. It is said to lack a little a little less grunt than its predecessor, the VII, but that feels to be a relative term and the VIII was delivering constant, useable power that could be spilled off at the bar. Tucking into the waves, we discovered the incredibly tight but powerful turning radius of the VIII. The kite turns very tightly, but delivers great power as it does – it’s far removed from the slippy slidey type turn you may have grown to loathe. For proof of this tight powered turning, check the Board Test intro page shot – look at the tight arcing track in the wave face afforded by it. We unhooked and went down the line on a bunch of waves and the VIII felt largely the same as when it was hooked in. This we appreciated and it allowed us to surf freely without the kite feeling like it wanted to overpower the situation. The overall stability of the kite in the surf zone is reassuring; it encouraged us to take more chances freefalling into waves and chancing last gasp downwind floaters. We also sessioned the VIII on flatter water in good winds, and then right at the very hilt (past at times) of its upper wind range. Thanks to the supportive 5th line and two point front line connections, the canopy was noticeably impervious to the jelly-fishing that was affecting other kites on the water at the time. Boosting with the 10m was an electric experience and is sure to encourage anyone who thinks they’ve hit the boost button too many times to think again. Sure you may get more hangtime from a bow for example, but it’s that catapult to the ether you’ll be after – not the glide. We particularly enjoyed the unhooked behaviour of the VIII. Although the kite relies on its front lines to keep things tidy it rides well with tension in the back lines and unhooking requires no real adaptation. The power came on quick and the bar felt light in our hand once we’d released our edge. Collecting the bar and relaunch after botched attempts is very favourable, and together with the lively performance and all round stability, it’s a kite that makes trying new stuff fun. What stood out for us particularly was the power the VIII generated through turns; it really puts the swing back in your session as it livens up everything from powered surfing to kiteloops via redirecting after a sent jump. A big performer that will appeal to all but the meekest of riders. Pros: Simple bar is good; tight, powered turning; very stable running downwind; bar feels nice and light for unhooking. Cons: Some riders may be used to even greater depower at the bar, and lighter bar pressure than the VIII can offer. 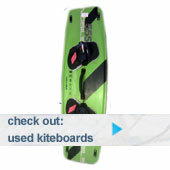 A kite for riders who like a powerful, engaging kite in the sky rather than a passive wing to tug them around. 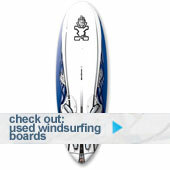 This is a very nice wave riding machine that delivers power when you need it. Twin tip riders will love the weightless ‘dead space’ that comes after the big pop.